In case you have a deck that isn’t going well with your taste, or you think your deck needs a redecoration, or it needs to be jazzed up a bit- you have stumbled upon the right blog. We understand how important it is to have a place to relax and soothe your mind and that is why we felt it necessary to share a few tips and tricks with you that can turn your regular deck into an exclusive one. With these tricks, you can make it more stylish, more comfortable, and more useful. Given below are a few suggestions for you to work on your deck and take it to the next level. A cleaning schedule for your deck: A clean, repaired, and well stained deck can only add to the appeal to the visitor’s eye. Before starting on the redecoration of your deck, you need to make sure you have a solid ground first (pun intended). If the deck is dirty and grimy, no amount of decors can’t hide it. The deck should be cleaned and re-stained at least once a year so it stands up better against the elements. Making the most of your outdoor space: Cluttered up decks are more troublesome than relaxing. It looks messy and can make your deck look smaller than it actually is. You can do some smart tricks with your decoration that can help you organise your lying around stuff and can save you some space. You can use multitasking furniture like built-in benches for your seating area which can offer you ample storage space to keep stuff like gardening tools or other supplies. Throw some cushions over and cover it with vibrant fabric to give it a fun look. Add some extra privacy: if you want some extra privacy for your deck, a pergola is the way to go. 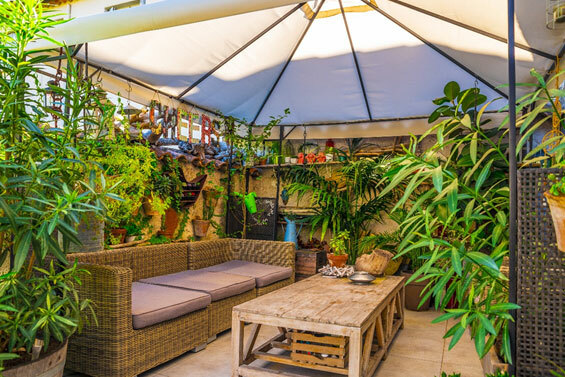 Put up a pergola and drape it with vines, this single thing can give you the ultimate backyard look you always wanted. A pergola will also help you have some protection against the harsh summer sun. Add colours: Some addition of colours here and there will make your deck really pop. If you have vinyl floor, there are unlimited options with colour and design. In case you have wooden deck, you can stain them however you want. Adding colour doesn’t necessarily mean you always have to go big on it, you can add colourful cushions, bright coloured decors, plants on a light hued deck and these will work perfectly. Make it comfy: The main purpose of having a deck area so you can have a ‘chill-out’ area. Kitting your deck with chairs and tables simply takes the purpose away. Only choose seating that allows you to put your feet up. A freestanding hammock and two steamer-style lounge chairs create a relaxed mood. Go vertical: If you have a small area for your deck, going vertical will do the trick if you want to expand space. You can add living wall plant to add the wow factor. You can create a display by putting up the divided trays hung in wood frame. Add a water feature: Adding a water feature to your deck will give your deck a new dimension. You can create a small container water feature for your deck to give it a classy look. Let there be light! Make sure you get the most out of your deck by putting up lighting features for when the natural light fades. For a better ambiance, you can hang some solar or low voltage lights on your deck. Even the twinkle light trend can too spruce up the deck creating a comfy atmosphere.